One proceeding on the by road in Borella passing shanties never imagines a bank at the corner end of the narrow lane. The speciality of the bank is not only the location. It is the only bank in the country entirely managed by women for women. 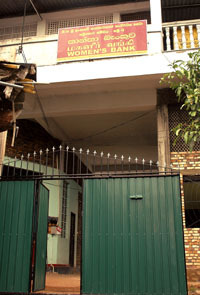 The Sri Lanka Women's Development Services Cooperative Society or the Women's Bank was established at divisional level to serve women in the locality, where the majority leads a hand to mouth existence. "The effort first came to fruition in 1989 involving three groups of women in Colombo. 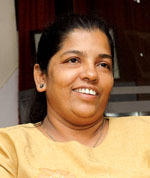 Founder Nandasiri Gamage proposed these women to save any affordable amount and the initial deposit was decided as Rs.5," President of the Bank Rupa Manel Silva said. They sat together for the first time to discuss their hardships and to find a solution. Earlier their only remedy was either to pawn a household item or seek the 'benevolence' of the loan shark in the village when their children cried of hunger. A group of five to 15 members in the locality selects a leader - a woman who is well aware of the background and hardships of the each member's family. Instead of running to the loan shark, this time they flocked to the group leader's house and obtained the required amount. "This is a people's mechanism for people. They know their requirement best and now they know how to fulfil that in the best way. Loans are granted for any purpose as we believe people tend to misuse money if their basic demands are not met. It prevents people from cheating as they will only think of building houses or self employment only if their stomach is full and children are happy," the President said. The bank registered under the Cooperative Department has branches in 18 districts, 80 divisions and 65 primary branches in tsunami-hit areas. The total of the deposits amounts to Rs.600 million and there are 37,000 members. "We believe that women are the crucial factor of economic development. They are best aware of hunger and suffering. 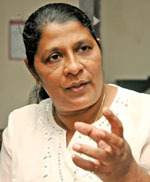 They are patient and unlike males women always give priority to the family," Manel Silva who was once a group leader, hailing from Bandarawela said. The two strict regulations in the movement are that the membership is not issued to drug manufacturers, distributors, dealers and their family members and loan sharks, said Secretary Anoma Lalini. 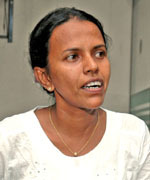 Lalini too was a group leader from Obesekarapura in a family facing many economic hardships. "Gradually, we overcame many of those difficulties and today we help and deal with people in areas like Manning Town and Wanathamulla, who are battling harsh living conditions," she said. The mechanism has been formulated to increase the deposits along with credit. "So people become independent gradually as they have saved for tomorrow," the Secretary added. Each group follows the previous one and there are no formal trainers in the system. There are 1500 to 2000 volunteer staffers and the loan scheme has expanded today from Rs.250 to Rs.500,000. There is a well equipped auditing section. Auditing is done daily. They have launched a medical insurance scheme worth Rs.400,000 for serious illnesses and it will be given as a grant. The next target on the agenda is to construct their own hospital. Free maternity clinics, nutrition centres, programmes to purchase books, shoes and uniform material for schoolchildren of the member families are among their other programmes. "This is a movement that trains women to be independent and they also learn management strategies in a practical way," Lalini concluded. Your diet and more particularly your calcium intake, plays an important role in maintaining bone mass. 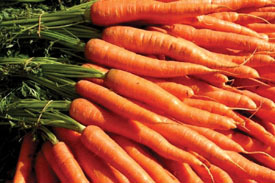 You are advised to have enough calcium - about 1500 mg a day. Dairy produce is especially rich in calcium. Skimmed milk and low-fat products contain just as much calcium as full fat products. So you can follow a low-calorie diet and still ensure that you have enough calcium. Some mineral waters are also rich in calcium. To complement your diet, a calcium supplement may be taken. There are various types of calcium supplements available. You may like to talk to your rheumatologist about them. The sun helps in the fight against osteoporosis. When exposed to sunlight, the skin begins the process of making vitamin D. This vitamin is important because it increases the absorption of calcium by the intestine, and encourages bone building. It is therefore advisable to get into the sunshine every day. If you cannot do this, your rheumatologist will want to be sure that you are getting enough vitamin D in your diet (fish liver oils, oily fish) and may suggest that you take a vitamin D supplement. Regular physical exercise plays an important part in the fight against osteoporosis. Physical exercise leads to stronger bones. It also strengthens the muscles and maintains 'good reflexes' which will reduce your risk of falling. People who walk regularly are at lower risk of suffering fractures. Although swimming is appropriate for arthritis, it is less so for osteoporosis, because it is the water and not the skeleton that takes the weight of the body! However, in cases of spinal fracture it can help the back to avoid becoming too severely bent. It is essential to avoid sudden stresses on the spinal column which could cause fractures. The effort of lifting, especially when leaning forward, should be avoided. - Kneel down or squat to make your bed. - Keep your back straight by bending the knees when you pick something up. - Do not carry suitcases or bags which are too heavy. As we get older, our risk of falling increases. You must identify and, fix where possible, all the things that are likely to cause a fall. - Have your sight checked. - Correct any problems with walking or balance (physiotherapy and using a walking stick may help). - Don't take drugs without talking to your doctor about them. - Limit the amount of alcohol you drink. - Take care in making sudden changes of position, especially when getting out of bed. If you feel dizzy when standing up after lying down, tell your doctor. - Clear areas you walk around in. - Take away or secure rugs which could slip. - Adjust lighting: increase lighting in areas you move about in and have the switches where you need them. - Adjust the height of furniture (bed, armchair, toilet seat) as necessary. Smoking increases your risk of osteoporosis. Leading an active life and maintaining a diet with sufficient calcium is the best way of preventing osteoporosis. In general, treatment will be more effective the sooner it is started. The sooner a patient with osteoporosis is treated with active therapy, the sooner their risk of fracture can be reduced.